The one that started it all. Symmetrical shape and stance for a balanced center of gravity to increase the ability to weight the deck through turns for better control and energy generation. The sidecuts allow for decreased torsional stiffness between the feet to exploit the board's torsional energy to allow for greater nuances in the turning radius. We currently offer five flexes spread out over two lengths. A softer flex pattern will give you more control and tighter turns at slower speeds, however a softer board is more prone to lose stability at higher speeds. If you plan on doing a lot of hard pounding tricks: shovits, bonelesses, etc, a stiff flex will hold up better. Note: It is natural for the boards to break in and become slightly flexier over time. 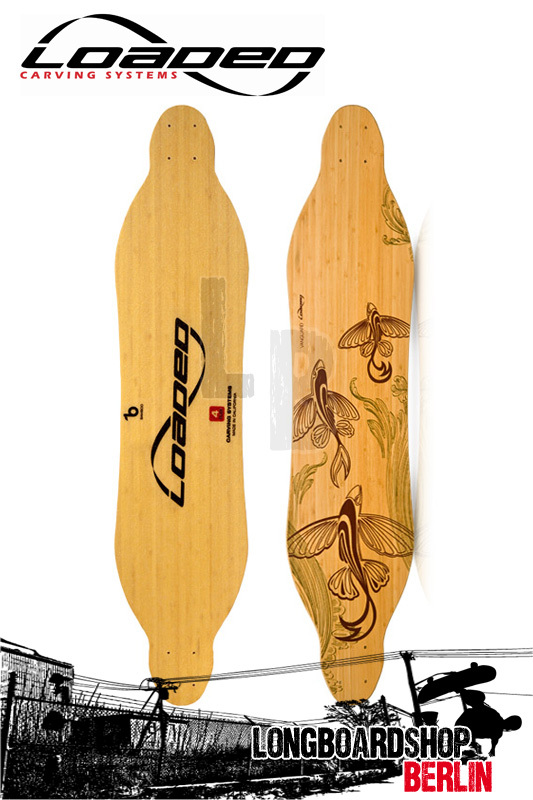 We recommend a 180mm longboard truck for the Vanguard. In particular, we ride the Randal R-II 180s and the Paris 180s. There are other trucks that work very well with the Vanguard including the Holey, Crail, Bear Grizzly, and Tracker Fastrack trucks. If you’ve found a different setup that works for you, let us know as we’re always interested.